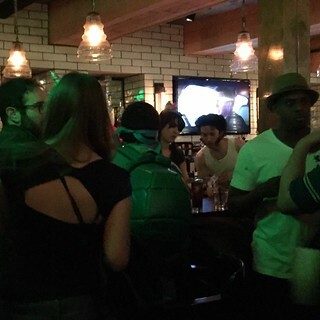 A few weeks ago, a local restaurant held a ComicCon-themed industry night, closing dinner service down early to serve comics-themed drinks and snacks. 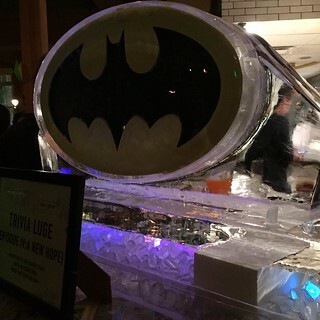 The staff were in full costume (but I neglected to get a photo of the guy with the Bat-symbol goatee), and there were entertainments that included a Batman ice luge and vintage video games (yes, we're at a point in time at which video games can be vintage). The restaurant in question, Alden and Harlow, is a current area hotspot with an innovative menu and cocktail list, so Tiny Doom and I, together with The Goog, decided to check it out. The evening was fun, and very crowded, and it got me thinking about other comic-book themed cocktails. 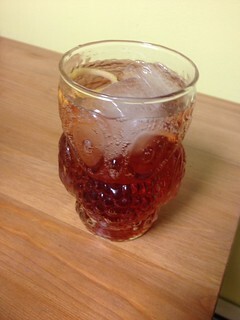 Too often, the ones you'll find online are sticky sweet, lazy, or both, putting garish color before mixology. Alden and Harlow's did not fall into this trap, but they did make use of some Hawaiian Punch and Mountain Dew. Is it possible to make a tasty, well-crafted cocktail that evokes your favorite heroes but avoids sticky-sweet additives? I decided to give it a whirl, and I press-ganged Tiny Doom and The Goog into helping! So here for your imbibing pleasure are three superhero cocktails that do not involve fruit punch, Pucker, or anything else with atomic food coloring. They do include somewhat obscure cocktail-nerd ingredients, so you might need to make a trip to the store before you make them. In keeping with most of my posts, I stuck to a DC theme for this first attempt. 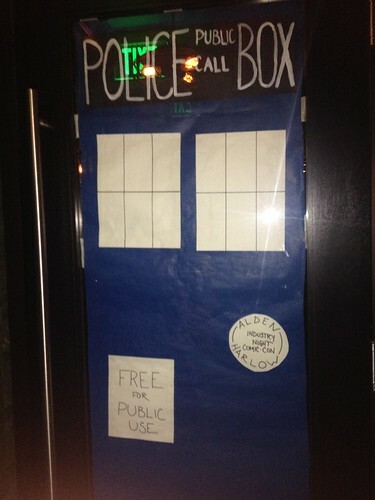 If people like this concept though, we can do it again with Marvel and other properties. To be fair, I also picked heroes I felt I could do justice to with the ingredients I did have to hand. First up is Superman! For him, I wanted something strong, all-American, and with a bit of something unexpected, something alien, if you will. I started with a rye whiskey base, rye being the quintessential American liquor (yes, even more so than its cousin bourbon!). In my travels, I'd picked up some boiled cider syrup, so I thought that would be a good addition - what's more American than apples? For the "alien" note I toyed with the idea of throwing in Cardamaro, a digestif from Italy that's made with cardoons and blessed thistle, but at the last minute I spied my tiki gear and thought that might be a more suitable direction, so in went some cinnamon syrup and the 'Elemakule Tiki bitters from Bittermens. The result was tasty and would actually make a great Thanksgiving cocktail - it tasted like apple pie in a glass, but without the cloying sweetness and with a bit of heat from the rye. If it didn't go against my "strong" mandate, I'd say it would be good with some seltzer, as well. I couldn't do Superman, of course, without Batman. The cocktail would need to be both dark and bitter. Tiny Doom pointed out that something that evoked childhood innocence lost would not be remiss, and suggested that I add some Root, a lovely concoction from Art in the Age that tastes like the very best root beer. I heeded her advice and added that to some cold brew coffee concentrate and Gosling's rum. The first sip was okay, but weirdly flat. 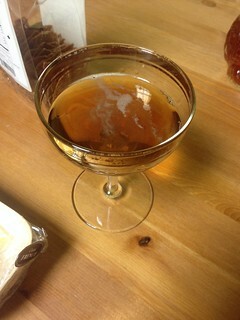 We decided to add a touch of Kahlua for sweetness, and it was vastly improved. 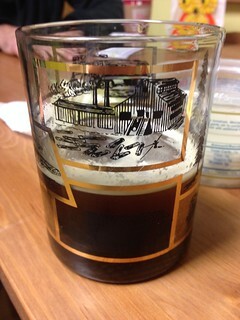 This ended up being dark and complex, like its namesake, and it looks fantastic in the glass. My version may also be a bit redder than what you would get a home, because the base I used, Cherry Heering, is usually a bit darker - this is a homemade version using sour cherries, which are more vibrant. I threw in a bit of Snap, another Art in the Age gem that tastes of ginger, since Wally West is my favorite Flash, and Tiny Doom came to the rescue once again by pointing out that a lemon twist would be just the right garnish to evoke the lightning bolt symbol. The result was light and refreshing, with a bit of zing from the Snap, and how gorgeous is that red? If you try any of these cocktails at home, let me know what you think! If you want to suggest other heroes or villains to get this treatment, tell me in the comments! Have a happy Thanksgiving everyone.